Martin Solveig has a knack for creating happy-go-lucky songs, the likes of which seem to lodge themselves in the inescapable reaches of your mind and resurface when you least expect it. Personally, they can be a bit bubbly for my tastes, and it doesn’t really help that the radio stations have taken to repeat like a raver to "Levels". But, being an optimist, there’s a silver lining to every cloud. 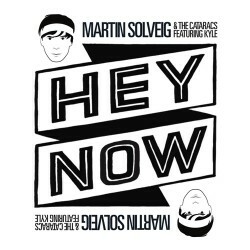 Today that lining would be Carnage’s remix of Solveig’s most recent effervescence, “Hey Now”, a track produced in collaboration with Cataracs and the vocalist Kyle. Though the lyrics remain, Carnage’s drop breathes new life into the song with a maddening, popping synth melody. The sound reminds me of Aoki’s “Steve Jobs”, though modified to be a skipping beat instead of a lolling head roll.